Indian selectors and team management did not pick Ambati Rayudu, who is considered the most important fourth place batsman in the batting line-up, for the Cricket World Cup starting in England starting May 30 in England. In the circumstances under which the VVS Laxman could not come in the World Cup 2003, sixteen years ago, the same story has been repeated with other Hyderabadi batsman Ambati Rayudu. In 2003, Laxman was considered as the third batsman in the World Cup team. But just a few months before the team selection, due to poor performance in the New Zealand tour, they could not get a World Cup ticket. Rayudu is playing at number three or four from the beginning in his career. He was dropped from number four on regular basis since October last year. But after three matches against Australia, they were dropped after the failure and now it seems that the 33-year-old Rayudu, like his senior Laxman in Hyderabad, will never be able to dream of playing the World Cup. The selectors then took Dinesh Mongia instead of Laxman. The basis of the selection of Mongia was that he could have contributed little to the batting, bowling and fielding of the game, while Laxman was a pure batsman. Vijay Shankar, who was elected as Rayudu, debuted this year in ODI cricket and has played only nine matches so far. According to PTI, the selection committee chairman MSK Prasad used the term 'triadyaam' on the selection of Shankar as he can contribute to all the three genres. Raidu is a pure batsman. 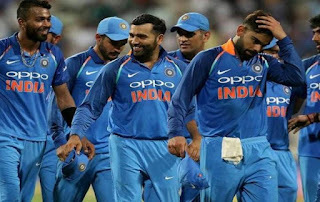 Laxman said about the World Cup 2019 team that said, 'This is a balanced team and India is a strong contender for the World Cup.' However, before selecting the team, he had selected his own 15-member team, in which he was given the place. Naturally, he would be frustrated by taking out Rayudu. When Laxman was taken out of the World Cup team, he then said, 'This was the most frustrating moment of my career. I worked hard for the World Cup. Last year (in 2002) I made the highest run (312) in the West Indies series and after that it was a great blow to the team. This disappointment will always be there. It took me a while to digest this news. Raidu also expressed his disappointment and used the word 'three-dimensional' in a sarcastic accent to taint the selectors. Raidu tweeted, "has ordered 3D glasses to watch the World Cup." Recalling Raidu's tweet, Pragyan Ojha had written, "An interesting case of Hyderabadi cricketers. I have lived in such a situation. I can understand frustration. ' The interesting thing was that Laxman played in the first three ODIs against New Zealand in 2002-03, in which he played 9, 20 and 10 innings. After this, Mongia was replaced in three ODIs, in which he could score only 12, two and zero. In spite of this, Mongia was selected in the World Cup squad, in which he scored 120 runs at an average of 20 in 11 innings. He took five wickets. Mongia did not stay in the team for much longer, and Laxman scored 102 against Australia against Australia in Chennai. Rayudu had scored 90 runs in the last match against New Zealand before the Australian series. He scored 33 runs in three matches against Australia and in the end, these three shirts were shattered to the dream of playing in their World Cup.